Developing campaigns with new, creative social media ideas is a constant challenge for businesses. A mix of tried and true methods, combined with out-of-the-box thinking, can help you develop an advertising calendar that’s relevant and keeps your target audience engaged and invested. These 33 social media marketing ideas can assist you in successfully designing and launching your company’s social media marketing plan. Continue reading to learn six ideas each for Facebook, Twitter, Instagram, Snapchat, and YouTube, plus three bonus tips you can apply to multiple platforms. Organic and paid social media ads on Facebook helps reel in new prospects and turn them into repeat customers. In today’s pay-to-play landscape, the real trick to using Facebook effectively is to make the end user’s experience feel natural — even if it has been carefully scripted and paid for. You can achieve results with carefully thought-out campaigns that mix organic and paid efforts for a seamless effect. Build high-conversion, informational content for Facebook ad campaigns. Linking a Facebook ad to a buy now page may seem like the best way to realize tangible ROI, but that move can leave visitors feeling taken advantage of, jaded, and likely to click the “ignore ad” button. Instead, create high-value content with strong subheadings and rock solid takeaways. 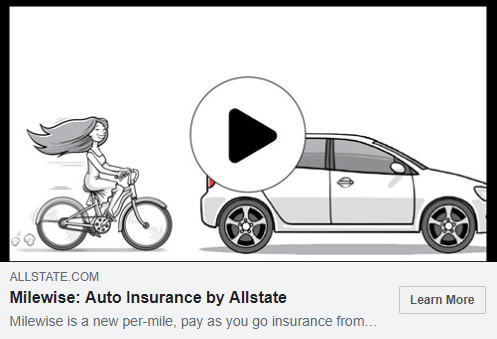 Allstate ran ads for their new Milewise “insure by the mile” program, and instead of a “buy now” page, the ads led to an informational page about how Milewise works. While the page included next steps for getting a quote, it wasn’t overly “salesy,” and it provided visitors with the info they needed to naturally move through the sales funnel. Play the emoticon game. You can double down on market research and get some interaction on your Facebook page by asking people to “Like or Love.” Present two products or services, and invite viewers to hit the like button or love button in reply. Run a photo contest. This is a fantastic way to generate more interaction on your Facebook page, collect a ton of user-generated content, and encourage more people to like your page. You can increase the value of such a contest with a high-end prize. Inspiration Design Center holds an “Ugly Kitchen Contest” every year, and the winner gets a kitchen remodel provided by IDC and its partners. engaging content like Tastemade’s videos about Latte Art and their Tiny Kitchen. Preview your content in photos and video. While linking straight to content is a solid tactic, offering a short preview with photos and videos to entice viewers to click through can increase traffic to your website or blog. Ask viewers to “caption this,” and tag a friend in a photo. Photos and videos get a much higher rate of engagement than simple text posts. Enhance that power by posting an unusual photo and asking viewers to caption it. Add another layer of fun and bring more engaged viewers to the table by asking them to tag a friend they feel is personified by the captioned photo. You can even compile a series of captioned images into a video just like ThatPetLife did in 2018. Twitter is now the social media center for customer support queries. Trends may quickly rise and fade away, but the right campaigns can more easily go viral. Best of all, Twitter is also celebrity-heavy, allowing you to interact with personalities who enjoy their fan base and often tweet back to fans. Tweet regularly. Twitter feeds move quickly, so stay relevant by adding hashtags to your posts to piggyback on trends. Mix self-promotional content with related content and plenty of images and videos for best results. Don’t be afraid to have fun. 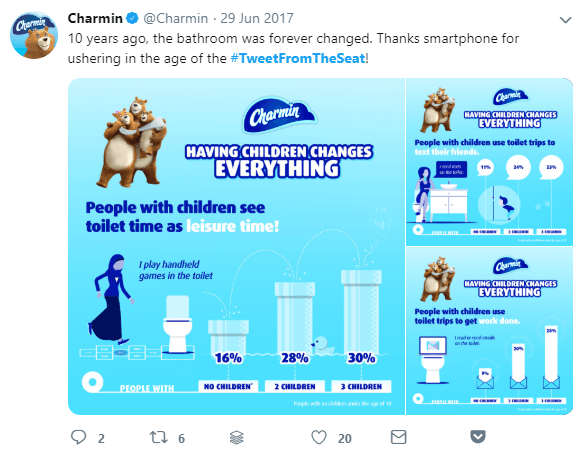 Charmin’s 2014 #TweetFromTheSeat campaign was hilarious and cheeky — and won six lucky Charmin users tix to that year’s Super Bowl. Run a poll — then follow through. The Oakland Raiders asked fans who they should shoot a behind-the-scenes video with, and posted the most requested video the next day. Create moments. Twitter now allows you to create a “Moment” by compiling Tweets, photos, and videos to summarize a current campaign and share them with followers. Imagine what you could do with a series of targeted Tweets and images. Clap back — nicely. Roast beef headquarters Arby’s expertly trolled Wendy’s with their #MakeMySandwich hashtag when they created a sandwich image of the iconic redheaded girl in pigtails, and tweeted it in response to Wendy’s constant trolling of other fast food brands. Instagram quickly became the undisputed queen of video content and remains an exceptional way for brands to connect visually with their audience. Formerly mocked for being simply a place to post pictures of what you had for dinner, it’s now a brand marketer’s paradise. With thousands of influencers in every industry imaginable, Instagram’s platform is the visual medium of consumers. Partner with influencers. Find an influencer with your desired fan base, then create a sponsored post to share your brand and product with a new audience full of potential customers. Host a takeover. Select an influencer to take over your brand for a weekend, like when Sephora asked the founder of Dress Your Face Live, Tamanna Roashan, to take over their feed. Both Tamanna and Sephora benefited from the campaign as they cross-promoted each other. Host a giveaway. Pair up with a non-competing brand to do a fabulous giveaway, and award a box of goodies to the winner of a photo, creative answer, caption, or hashtag contest. Share user-generated content. 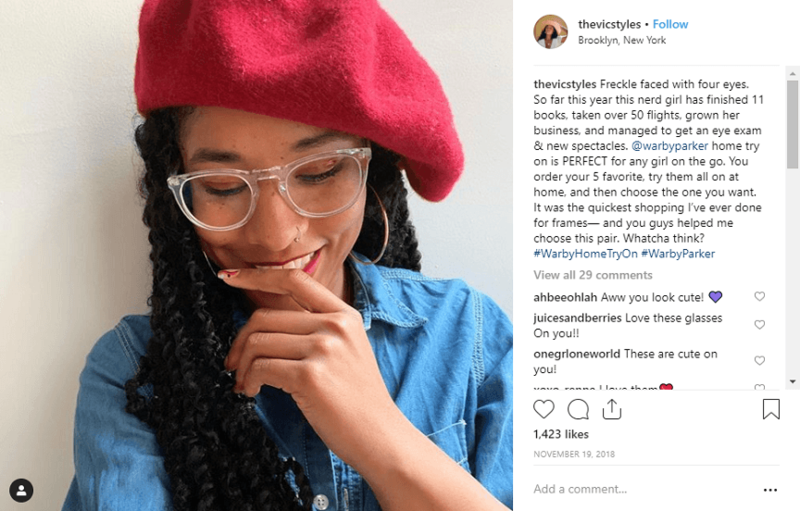 Warby Parker leveraged user-generated content by asking customers to share #WarbyHomeTryOn photos on Instagram. Create memorable hashtags. REI’s #OptOutside hashtag encouraged followers to get outside and share their adventure photos — a great way to promote brand engagement. Use Insta’s “Story” option to promote flash sales and coupons. You can boost visibility by using a popular hashtag related to your brand and promotion. Snapchat, rather than being “just another Instagram,” has a life of its own as the “there-then-gone” version of visual media — blink and you’ll miss it. Snapchat was formerly a platform used primarily by pre-teens and teens to share images, but has now become a powerful tool for marketers seeking to capture the eight second or less attention span of a millennial audience. Embrace the Snapcode. The QR-looking Snapcode that is assigned to you is perfect for posting to other platforms to draw mobile social media users over to your Snapchat feed. Buy a geofilter. These can be customized for your next event, or you can do like LA-based real estate developer Caruso and buy an annual license to dress up your Snapchats. Run a Q&A. Snapchat Q&As are short, sweet, and easy to run — just have followers send you Snaps with their questions, then create a video of yourself and/or staff answering them to post on your Story. Host a contest. GrubHub won the Shorty Awards in 2014 with their #SnapHunt scavenger contest that asked users to snap various images and/or doodle them to enter every day for a week. Daily winners got $50 in GrubHub credit. Trade coupons for content. You can collect a wealth of user-generated images of your product by offering a small discount in return. This is an excellent way to partner with other brands for a dual promotion. Get creative with 3-D. One of the most innovative Snapchat campaigns of 2017 saw Netflix use a 3-D World Lens to transport viewers into the world of Stranger Things. Over 400 hours of video content are uploaded every minute to YouTube, which made the “social media platform” list for the first time in 2016. YouTube quickly blew past other platforms to land behind Facebook in the #2 slot going into 2019. YouTube can be a powerful addition to your social media toolkit, and provide your brand with access to even more influencers in your vertical. Use intros and outros to create a consistent brand image. This can help make an instant impression on new viewers, and you can add your social links to other form profiles to encourage cross-platform interest. Partner with other YouTube personalities. YouTube newcomer and singer Peter Hollens’ channel really took off after he partnered with violinist Lindsay Sterling for a Skyrim cover — a video that now has over 70 million views. Link other content. Drive traffic using YouTube to encourage people to visit your website. You can mention an offer using a call to action (CTA) to push traffic and drive revenue. Use annotations. Linking to other YouTube videos you have created can spur ongoing interest. This works exceptionally well when you connect videos with similar content like the Holderness Family does annually for Christmas after their viral “Christmas Jammies” video of 2013. Create how-to videos. Some of the most popular videos on YouTube are instructional. Take something your brand can help people to do well and show them how to use your product or service effectively to achieve their goals. Find a brand ambassador. Sponsoring another YouTuber is a great way to get mentions of your brand out there, and they can offer a personal fan-only code to their following on your behalf. Scottish teen Jamie Genevieve built a makeup tutorial channel, and now is a brand ambassador for Rimmel London. The best campaigns can be adapted and executed flawlessly across multiple platforms to reach a broader audience. Avoid duplication — repurpose and tailor each piece of content for the new platform for best results. Cross promote big initiatives. Sometimes multiple platforms can each be engaged to accomplish a different goal, using the same hashtag or initiative. Tidy Cat’s #KittenWeek managed to leverage YouTube, Twitter, and Facebook in one of the biggest successes the brand has ever seen — growing subscribers by 115 percent and garnering 1.5 million views in just ten days. Drive to a promotion on a single platform. For a big promotion, tracking on one platform may be best, and you can also increase your cross-platform followings. For example, host a big giveaway on Facebook. Then tie-in targeted posts on your other platforms to encourage people to follow your Facebook page to enter. Combine real-world and digital activities for greater impact. In 2013, Land Rover USA used on-the-ground influencers, a YouTube homepage takeover, and Google Ads at the start of an initiative that eventually increased its digital sales to an astounding total of 15 percent annually. Implementing these social media campaign ideas can help take your digital footprint to the next level. You’ll quickly learn which platform is most effective for your brand, but don’t limit yourself: a cross-platform approach is always ideal. Create a content calendar that allows you to develop core pieces of content, and then redevelop the ideas independently for each platform to present your audiences with a cohesive brand experience that is consistent but fresh from platform to platform and day to day. Contact WebFX for a social media campaign management quote today.